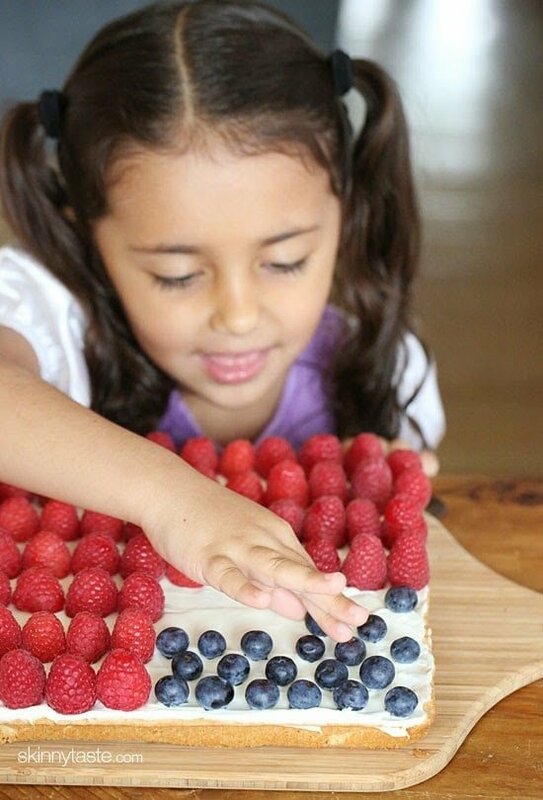 Red, White and Blue fruit “pizza” is more like a cookie bar, topped with cream cheese frosting and fruit – The perfect 4th of July dessert! 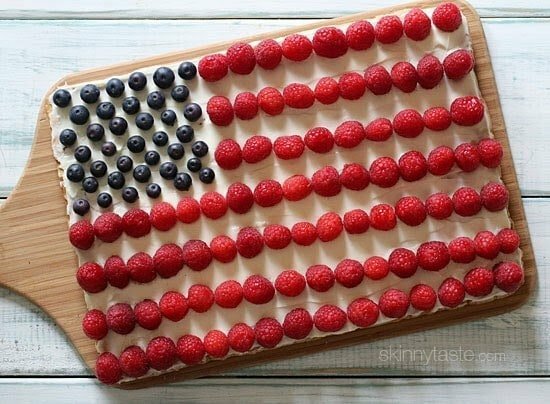 I love making holiday inspired recipes, a few of my favorite Fourth of July recipes are Red White and Blue Trifle, Red White and Blueberry Cheesecake Cupcakes, RW+B Chocolate Chip Fro-yo Sandwiches, and Red White and Blue Fruit Skewers with Cheesecake Yogurt Dip. My slimmed down fruit pizza was such a hit I decided to make a red, white and blue version using blueberries and raspberries for my stars and stripes for the Fourth of July! 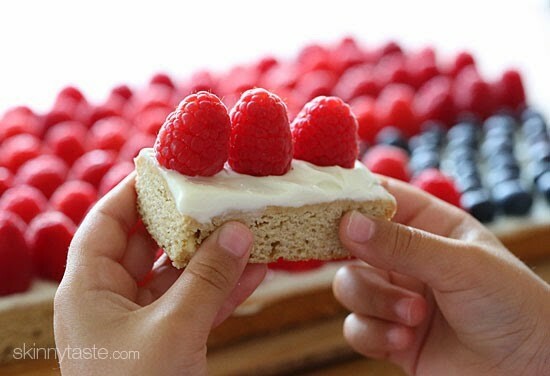 If you don’t recall, this is a lightened up white chocolate chip cookie bar topped with cream cheese frosting and fresh fruit – delish! Madison helped me make this American flag and carefully placed the “stars” onto the frosting. She also helped me taste-test the final product to make sure it tasted yummy – she approved! You could also used sliced strawberries if you prefer, but using raspberries didn’t require any cutting, so it was pretty quick to assemble. Wishing you all a happy Fourth of July weekend! Lightly spray a 9 x 13 x 1.375 inch non-stick baking pan (quarter sheet pan) with cooking spray. Fold the dry ingredients into the wet ingredients with a spatula in two additions until the batter is very well blended. If the batter looks more “crumbly” than smooth, add just a drop of water at a time (ONLY if needed) until it smooths out. Bake 14 to 16 minutes, until the edges are golden and a toothpick inserted comes out clean. Don’t over-bake or your bars will be dry. Let it cool completely on wire rack. 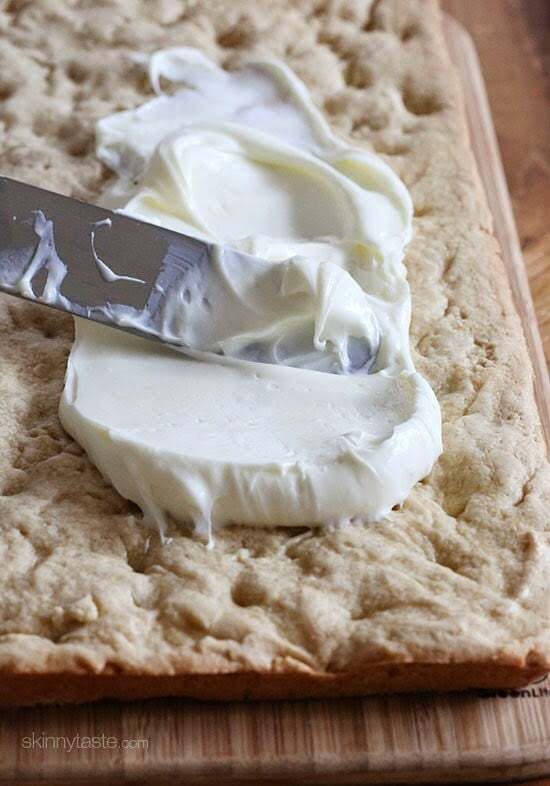 Spread the frosting evenly over the surface of the cookie, leaving a small margin around the edges. Layer the fresh fruit over the frosting. To serve, cut the bars into 28 pieces (I did 7 cuts by 4 cuts with the knife). What are the WW FS Points? I was also wondering how you get this out of the pan…or do you? I made this 2 years ago and I forget what I did! a get-together. My goal for each gathering is to bring a new skinny taste recipe. So far, (and I anticipate ever time), the dish I make has been so well received! Thank you for your recipes! That is great, and you are welcome! Wow, you even have the correct number of stars and stripes! Impressive, props to you. I made these today with a twist. I used the base recipe with applesauce instead of the butter and made them into white chocolate raspberry bars. I made an extra half batch of the batter. I spread half the batter in the 9×13 pan, then used a cup of raspberry preserves spread evenly over the batter, I spread the remaining batter over the top. I baked then for approximately 30 minutes, I pulled them when the knife came out clean. I let them cool and spread the cream cheese frosting on them! They turned out really really yummy! I made this for our 4th of July potluck & it was so delicious!! I made this yesterday and it was a HUGE hit! 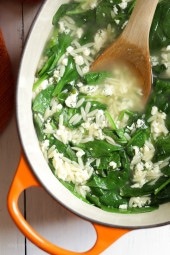 Easy, delicious, kid-friendly, and healthy! Thank you. 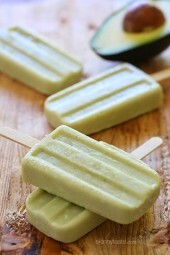 This looks so fun and yummy! I totally would love to do this with more types of fruits! I just made this. I must have used the wrong size pan or over mixed it because it came out very flat, like 1/4" thick 🙁 I guess mine is a flatbread pizza! At first I thought I messed up by adding baking soda and no baking powder but the recipe says baking soda. Oh well hopefully people eat it! I wonder, too, if I could leave out the white chocolate chips as that is just added calories and sugar that I really don't need if it will taste ok without??? Anyone try that by any chance? Leaving out the white chocolate chips should not be a problem. For clean cuts, you must wipe the knife before each cut. But I am such a clutz about removing items from a deep dish…so no good advice from me! My hubby loves raspberries. ..what a gorgeous creation! As I reviewed this, I thought, "Hmmm….sounds similar to the amazing Cranberry Bliss Bars I made last Christmas." Voila! 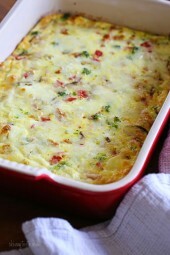 Wonderful way to remake a great recipe for the season. On tomorrow's "To Do List" with the grands. How did you get it so perfectly out of the pan? If I wanted to use Coconut flour and coconut sugar instead, would you happen to know the measurement equivalents? I LOVE this fruit pizza!!! Pinned! have a GREAT 4th!! What's the best way to get it cleanly out of the pan? Do you let it cool completely before removing the cookie from the pan? I was going to try this with semi-sweet chocolate chips, do you think it would be ok? My family doesn't like white chocolate 🙁 I love the recipe! OMG Gina, this sounds sooooo soooo good! YUM! It's gorgeous! Pinning! Yes, Yes and Yes! 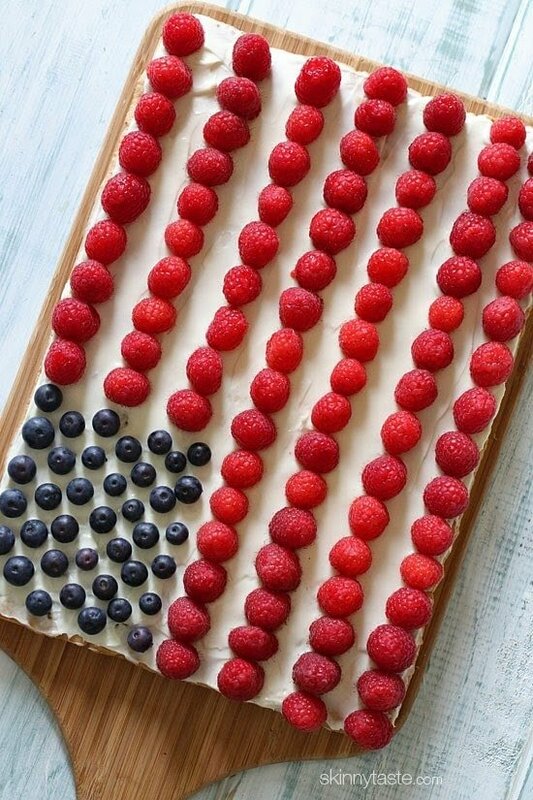 This looks so good and I love festive desserts for the 4th! Love this Gina – Looks super tasty! It looks so beautiful, the idea is wonderful. What a fun project for you and your daughter! A great memory-maker for her plus it sounds delicious. Thanks for sharing…:) Happy 4th of July to all. This is my favorite dessert to make for the 4th of July! I usually make a sugar cookie for the base, but maybe this year I'll try your recipe. I love the idea of using raspberries instead of strawberries like I usually do. Who does love less prep?! Gina this is adorable! Did you cut the sweetness of the cake to balance the white chocolate chips? I ask because I don't love white chocolate and was thinking of subbing semi-sweet chips, but I'm not sure if I should up the sugar to compensate. Thanks! New commenter but I have been making your recipes for over a year and I love them all :). Mmmmm it looks so delicious and fun, perfect for a festive occasion! As I was scrolling through the pictures my eyes were going all funky because the berries that are perfectly lined up gave it this cool "effect", haha. Well if I make it, I'll let you know! I made your previous version for a party this past wknd, & they were a HIT!!! Can I make this the day before or does it need to be the day of? Yes, you can make everything the day before, but I would assemble it the day you eat it. I made mine the day before (including adding the fruit), & it turned out perfect! Did you store the crust in the fridge? Or did you leave it out? And did you make the frosting the day before too? Did it get watery?? I made the day before. left the crust out, frosting in the fridge – it did not get watery. thicker if anything. I took it out about 30 minutes before adding to the crust! im a new wife and chef haha what exactly is folding? To fold is to combine gently, usually a heavier ingredient into a lighter one – like flour into beaten egg whites for an angel food cake. 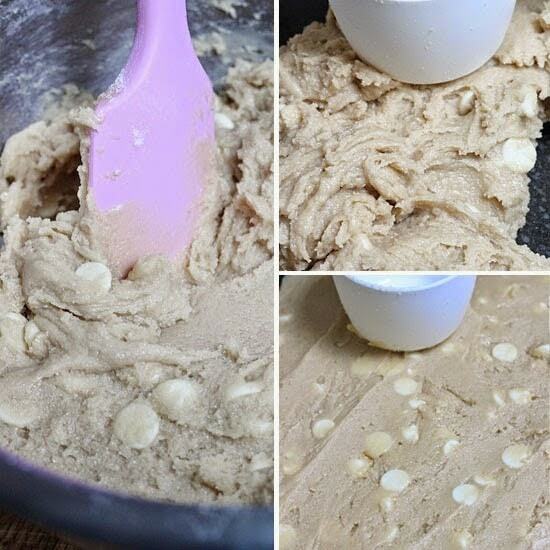 For this, just put the chips on top of the dough, and using a spoon or spatula, scrape down the bowl and lift the dough over the chips until they are mixed together. The main thing is to not overmix or beat the dough or it will become tough. Hope this helps and your pizza is great! Can the applesauce be substituted with something else? I'm allergic to apples! One time that I made this in a pinch, I realized I didn't hae any aapplesauce! I ended up using vegetable oil, which obviously makes it not so healthy, but it did come out delicious. This is so cute! 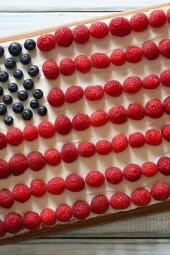 I love flag-shaped things for the Fourth, and this looks so yummy and healthy with all of that fresh fruit. Cute! Was already planning on making your fruit pizza for a bbq on the 4th! Love all your wonderful ideas.